In Cyprus, we are blessed (sometimes tortured) with lots of sun. Which means we are lucky enough to be able to grow lots of fruits. I have a friend who has a plot of land where he grows lots of fruit trees. It’s like a living grocery store. This week he invited me up to pick some fruit. Apricots, peaches and plums are in season at the moment and there were tons on his trees. By the time we finished we had a few boxes of fruit. So I decided to make a nice summer upside-down fruit flan. Light but sweet. Delicious when warm with ice cream. And good the next day. And the day after. It’s a pretty straightforward recipe, and I even baked it inside of a frying pan which I placed in the oven. 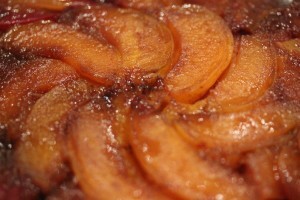 It’s gorgeous and can be made with a variety of fruits: nectarines, peaches, plums. 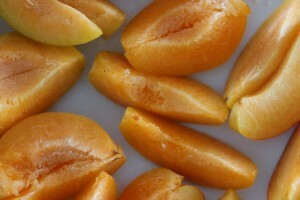 I had mostly apricots so I used these, and threw in some peaches and plums too. And it’s a great way to make use of any delicious fruits you have before they spoil. 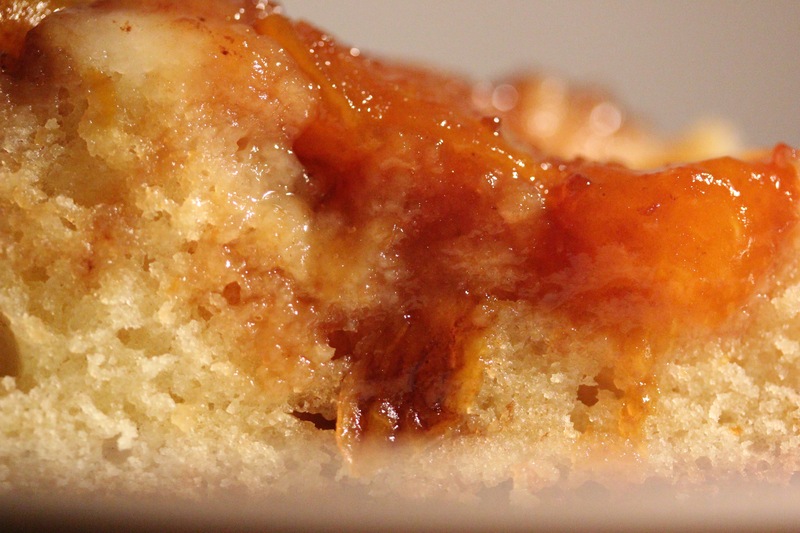 If it’s your first time making an upside-down flan, you have to be careful to slice the fruit thinly so that you can make a pretty looking pattern, but otherwise there is nothing that difficult about this flan. It’s good and perfect if you want to cook something for an outdoor summer dinner party. 1. 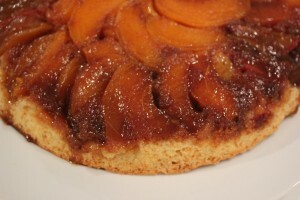 Note that this is an “upside down” cake which means we will be making the top first and flipping it around at the end. Note also that we are melting butter and sugar over the stove in a pan that we will eventually bake the cake in. This means that whichever pan we use, we need to heat it on the stove and put it in the oven and the bottom will become very sticky. As such, you can use a cake pan, a cast iron pan or a frying pan (I used a frying pan). 2. Make the fruit layer first. 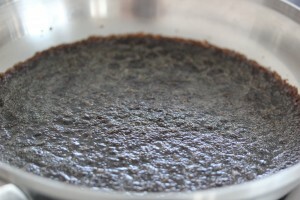 Melt 3 tbs unsalted butter in a 9-10 inch diameter frying pan (or whatever pan you decide to bake the cake in) over the stove. Add the brown sugar and stir while cooking until the sugar has melted and begins to bubble. Remove the pan from heat and let it cool. 3. Slice the fruit into thin slices. Once the sugar/butter mixture has cooled (about 2o minutes) arrange the slices in a pinwheel design – sort of a circle where the each fruit slice sits on another just a little as it circle shape is formed. 4. Then prepare the cake. Preheat the oven to 190C. 5. Mix the 8 tbs of butter and sugar until fluffy. Add the vanilla, then one egg at a time, until smooth. 6. Stir together the flour, salt and baking powder. 7. Stir in half of the flour mixture to the butter mixture. Then stir in the milk. Then stir in the remaining dry ingredients. 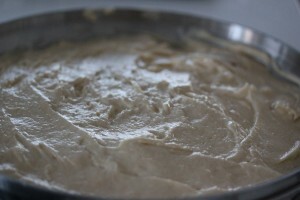 Be care to not overmix the mixture; just stir the ingredients until the flour is barely incorporated into the batter. 8. Spread the batter over the fruit, smoothing it with a spatula if necessary. Bake the cake for about 45 minutes to one hour. If it is a thick frying pan, it may need more time; if it is a thin cake pan, it may need less time. The cake is ready when it turns dark golden brown on top, the center feels just set and it begins to pull away from the sides of the pan. 9. Remove the cake from the oven. Let it cool in the pan for about 20 minutes, then place a cake plate on top and wearing oven mitts, flip the cake out onto the plate. Be a bit careful here as the hot caramel might drip, and the pan and plate might slide around if you don’t have a good grip. 10. Serve warm with a scoop of ice cream. You can also heat it up the next day and do the same.